The atria on the first floor of the Ransom Center are surrounded by windows featuring etched reproductions of images from the collections. The windows offer visitors a hint of the cultural treasures to be discovered inside. From the Outside In is a series that highlights some of these images and their creators. Interact with all of the windows at From the Outside In: A Visitor’s Guide to the Windows. Below, Ransom Center volunteer Karen White writes about two portraits of James Joyce on the windows. 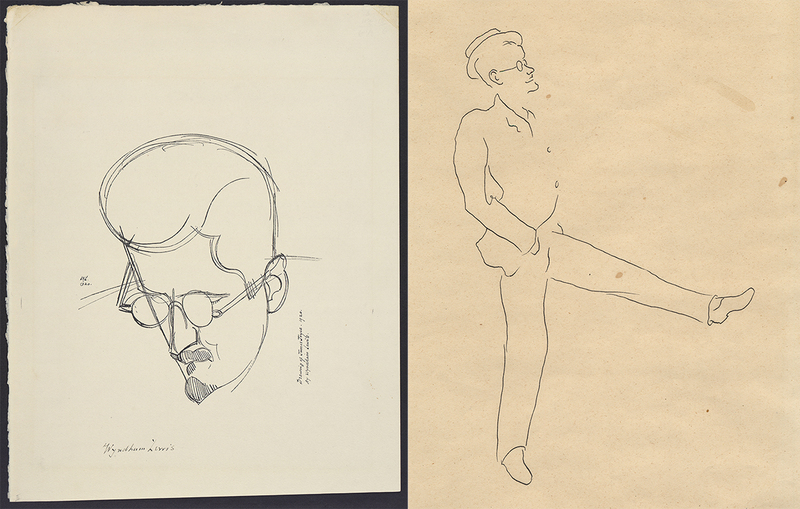 The windows of the Harry Ransom Center show two drawings of James Joyce, one by Desmond Harmsworth and one by Wyndham Lewis, depicting very different sides of the famous writer. 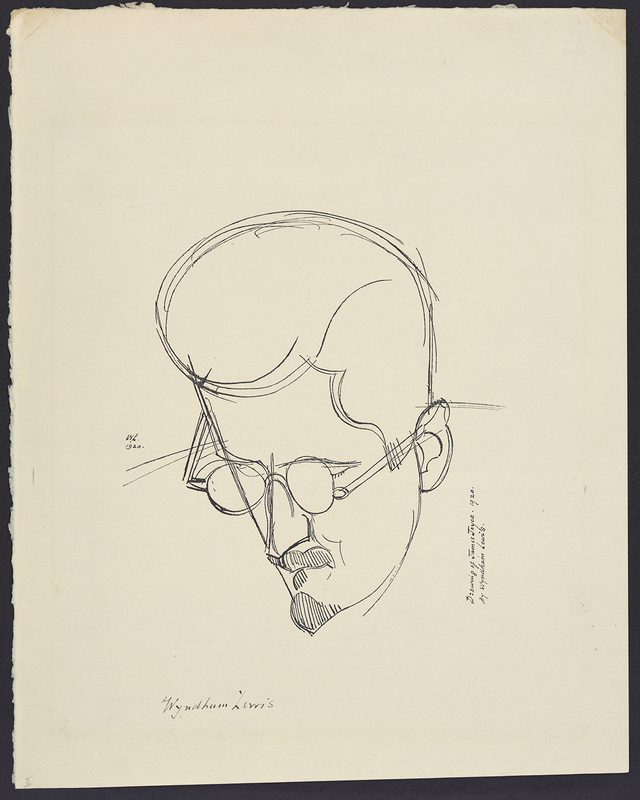 The Lewis drawing, dated 1920, shows a portrait of Joyce from the outside: head down, identifiable by the thick eyeglasses and small beard. Lewis was one of Joyce’s Modernist contemporaries—a novelist, experimental artist, and founder of the abstract art movement Vorticism. 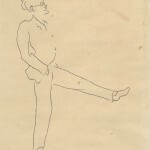 He was also a well-known curmudgeon and critic, and his sketch hints at the distance from which he approached his fellow artist. Harmsworth, in contrast, was one of Joyce’s publishers and enjoyed long evenings talking and drinking with the writer. 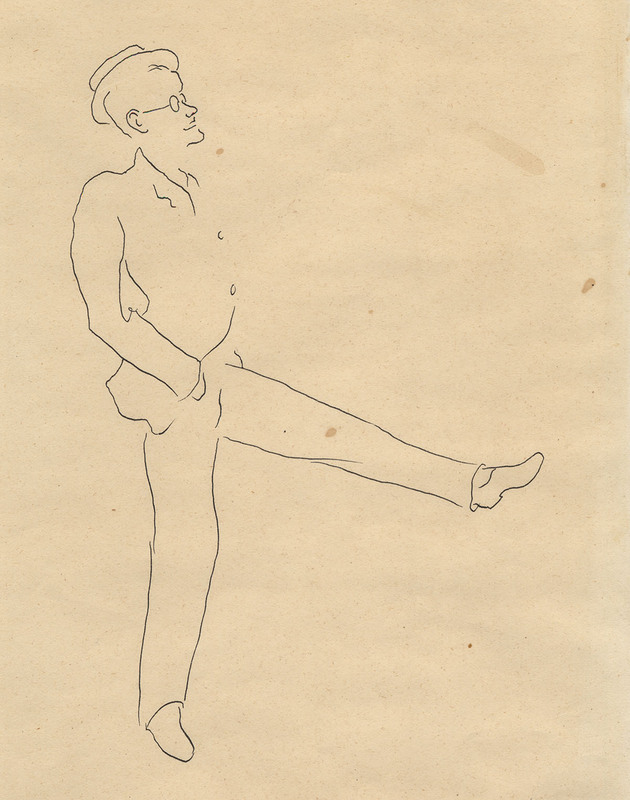 His drawing expresses more of Joyce’s personal character. Modernist author James Joyce is known for his experiments with stream-of-consciousness writing, especially in his most controversial novel, Ulysses. Joyce was born in Dublin, Ireland, in 1882, into a large and no longer prosperous family. His literary interests and abilities were recognized when he was young, and he was educated in Jesuit schools and at University College Dublin, where he studied English, French, and Italian. Joyce enjoyed learning languages, especially when they added to his perspective on art; for instance, he admired playwright Henrik Ibsen, so he learned Norwegian to read Ibsen’s original texts. At Joyce’s death, he knew more than 17 languages, including Arabic, Sanskrit, and Greek. Joyce left Ireland in 1904 and made only four return visits, the last in 1912. 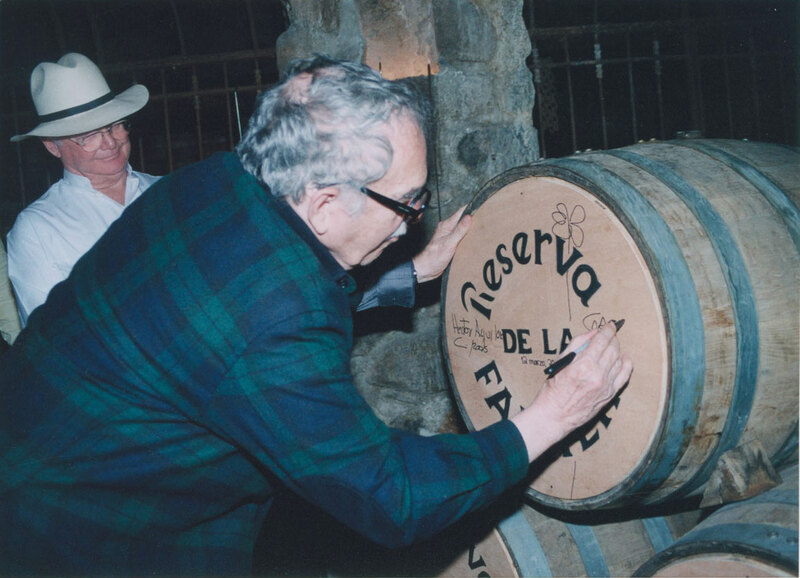 He taught English in Trieste for a number of years, moved to Zurich during World War I, and then went to Paris, from which he and his family fled the Nazis in 1940 to return to Zurich. Despite leaving Ireland as a young man, Dublin society continued to be the backdrop for all of Joyce’s work, including the story collection Dubliners and the novels A Portrait of the Artist as a Young Man, Ulysses, and Finnegans Wake. Ulysses provides an in-depth perspective on life in Dublin at the beginning of the twentieth century, told through the thoughts and perceptions of a number of its citizens over one day, June 16, 1904, and in a kaleidoscope of styles. As Joyce commented to a friend, he wanted “to give a picture of Dublin so complete that if the city suddenly disappeared from the earth it could be reconstructed out of my book.” This included aspects of life that until then had not been seen as fit for literature, from a trip to the outhouse to a voyeuristic encounter at the beach. The book was initially published in serial form in the journal The Little Review, but in 1921 it was banned in the United States for obscenity. Sylvia Beach published a complete edition of Ulysses in Paris in 1922, but it remained banned in the United States until 1933, although copies were smuggled in, and the book was widely known. 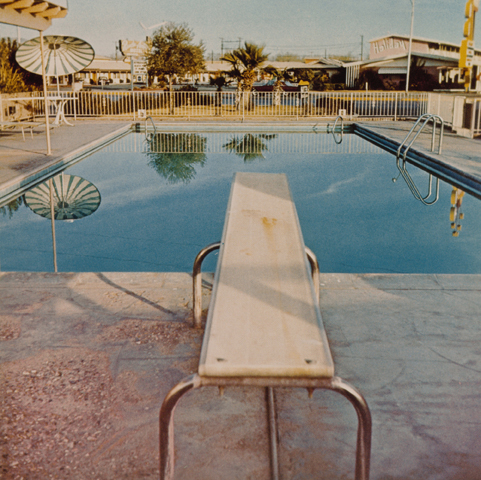 When the American edition was published, the response was sometimes fierce. 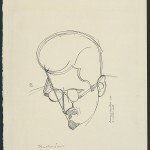 A reviewer in The New York Times commented that “the average intelligent reader will glean little or nothing from it” and that its narrative fashion was “in parodies of classic prose and current slang, in perversions of sacred literature… in symbols so occult and mystic that only the initiated and profoundly versed can understand.” When Joyce died in January 1941, the Times obituary stated that his status as a writer “never could be determined in his lifetime” and quoted critics who held a range of views. One placed him among the “Unintelligibles,” with Gertrude Stein and T. S. Eliot; another argued that Ulysses was a novel “which only could have been written ‘in an advanced stage of psychic disintegration;'” and a third hailed Joyce as one of “the great innovators of literature… whose influence upon other writers of his time was incalculable.” Today, the latter assessment is the one that prevails. The Harry Ransom Center has collected all of Joyce’s works in depth, including four of the first 100 signed copies of Ulysses. It also has Joyce’s own Trieste library, which was formed between 1900 and 1920, comprising 673 volumes and including many source books used in his writing.